The event started off strong with Marc Benioff’s keynote. He is truly an engaging, entertaining speaker, and his main theme - everyone has the power to be a Trailblazer and make the world a better place - is something we’re very passionate about at Orion. If you want to read about the highlights of his talk, take a look at this story on the Salesforce blog. For me, one of the main highlights of Dreamforce was having the opportunity to speak on a panel about building a productive field sales organization using inside sales best practices, hosted by MapAnything. During the session, which was moderated by MapAnything CMO Brian Bachofner, I shared details about how Orion clients are leveraging the Salesforce Platform and MapAnything to empower and make their field sales teams more efficient and productive. It was great to see how interested the audience members were about how the many ways they can optimize the Salesforce platform with MapAnything’s powerful geo-productivity tool and tips for maximizing user adoption. As MapAnything’s first Certified Partner, we look forward to doing many more events together in the coming months, beginning with a MapAnything User Round Table on December 15, the day after the Salesforce World Tour in New York City. 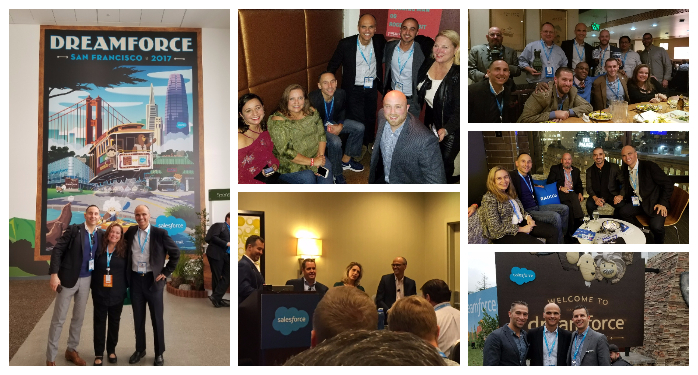 As always, Dreamforce also provided the perfect opportunity to spend valuable time with clients and partners. Thanks to our partners at Salesforce, MapAnything and Radius Intelligence, we enjoyed dinners, where together we got to share great food and conversation with our clients. It was also a pleasure catching up with our longtime friends and partners at Scribe. On the opening day of Dreamforce, a thought leadership article in Upside on the data architecture challenges of the Consumer Packaged Goods Industry was published that was written by Scribe’s vice president of marketing, featuring an Orion interview. We look forward to working with Scribe on additional projects in 2018. Dreamforce also gave us the opportunity to meet and update Salesforce executives and leadership on our progress and to keep building our partnership. Overall, Dreamforce 2017 was an event like none other. It was inspiring and empowering to be among the more than 170,000 attendees from 83 countries who were all extremely excited about the unique Salesforce culture and the amazing products and capabilities Salesforce continues to provide.